The Magnificat and Nunc dimittis in G were written and published in 1940. Dr H K Andrews had written a boisterous set of evening canticles that Bairstow considered foreign to the spirit of the words. 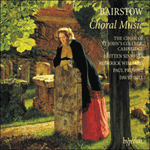 The G major Service, meditative and prayerful, was Bairstow’s reaction to Andrews’ setting. The key signature of one flat gives an accurate hint of modal harmony and melody.